[Vishwasnavada] has a neat plan though, using an ancient phone as a remote trigger device, by interfacing it with an Arduino. There are many ways this could be achieved depending on the model of the phone in question, but one thing common to nearly all devices is a vibration motor. Removing the motor and taking its power line to a GPIO allows the Arduino to sense when the phone is ringing. The idea then is that a call can be placed to the phone which is not picked up, but because it triggers the vibration motor it can be used to make the microcontroller do something remotely. A hack with limited capabilities then, but one that is cheap and simple, uses a recycled device, and should work almost anywhere populated on the planet given the global reach of 2G networks. This isn’t the first respin of a classic Nokia we’ve brought you, they will also talk data. The Nokia 3210 is the greatest cell phone ever made. The battery lasted for days, custom color covers were available at every mall kiosk, it had the Snake game, and the chassis for this phone was finely crafted out of the crust of neutron stars. It was indestructible; it is the reason we now appreciate technology over more impermanent concepts like relationships and love. For his Hackaday Prize entry, [Bastian] is bringing the Nokia 3210 into this century. He’s designing a circuit board with the same footprint, the same button layout, and a better screen that drops right into the lovely plastic enclosure of the 3210. The current BOM for the upgraded 3210 includes an STM32 F7 microcontroller, which is more or less the current top of the line ARM micro you can get. For wireless, [Bastian] is using an A7 GSM/GPRS module and an ESP8266 for a little bit of WiFi. For a dumbphone, this is ludicrously overpowered. Provided [Bastian] gets a prototype up and running, there will be some interesting applications for a device this powerful in a package this indestructible. One of the things [Bastian] has been butting his head against with this project is KiCad. 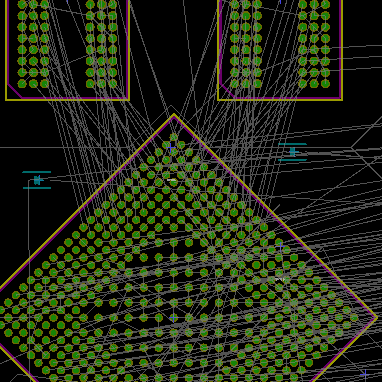 Microvias don’t work like they should in KiCad — they’re restricted to the outer layers only. This is a problem for routing a complex board like this, so [Bastian] wrote a patch that gives KiCad an ‘I know what I’m doing mode’ for microvias everywhere. This is truly the spirit of The Hackaday Prize: not only is [Bastian] building something ridiculous, he’s also creating the tools to do it. Old hardware you may have on hand cannot only inspire projects in their own right, but can facilitate the realization of any ideas you have been planning. Using a Nokia N900, [MakerMan] concocted a light-up sign with a live subscriber and view count of his videos. [MakerMan] milled out the logo used on the sign with his DIY CNC machine — built from rotary bearings and recycled stepper motors off industrial Xerox printers. The meticulous application of a jigsaw, rotary tool, and grinder resulted in a sturdy frame for the sign while a few strips of RGB LEDs imbue it with an inspiring glow. All that was left was to mount the phone in place and tape it for good measure. [S.PiC] has been working on a computer case styled to look like the Vulture mech from Battletech. We’re not sure if his serious faced cat approves or not, but we do. The case is made from artfully cut plywood. We kind of hope he keeps the wood aesthetic. However, that would be getting dangerously close to steampunk. So perhaps a matching paint job at the end will do. In some of the videos we can how he’s cleverly incorporated the computer’s components into the design of the case. For example, the black mesh on the front actually hides the computer’s power supply intake fan. The computer inside is a small micro-itx formfactor one. Added as peripherals to it [S.Pic] has pulled out the hacker-electronics-tricks bible. From hand soldered LED grids to repurposed Nokia LCD screens, he has it all. In one video we can even see the turret of the mech rotating under its own power. It looks like the build still has a few more steps before completion, but it’s already impressive enough to be gladly worth the useful table space consumed on any hacker’s desk. Video after the break. Most all of us recall the Blinking Screen of Death on original NES systems. This was caused by a bad connection between the cartridge and the NES cartridge connector. For whatever reason, it became a very popular idea to give a quick blow down the cartridge, even though this didn’t really help. [Dale] decided to play on this annoying problem by making the NES Blow Cart! Inspired by a previous cartridge hack, [Dale] mounted a custom made circuit sporting the ever popular ATtiny85 in a Super Mario / Duck Hunt cartridge. A small microphone sits where the original cartridge connector was, along with the on/off switch and program header. A quick blow triggers the ATtiny85 to play a song. The most difficult part for [Dale] was to figure out how to get the ATtiny to play “music”. This was solved with the discovery of a library called Rtttl. This allowed him to take old Nokia Super Mario and Zelda ringtones and get them on the Attiny85. All files, including the rtttl library are available on his github. Be sure to stick around after the break for a video of the project in action.